Want to hire the best limo in Liverpool? A gem in the North West’s crown, Liverpool was a deserving winner of the European Capital of Culture title in 2008. The city continues to go from strength to strength – it’s a bustling hub of shopping, museums, nightlife and history, making it a perfect choice for a day or night out. So what better way to see all that Liverpool has to offer than from the comfort of one of our luxury limos and hummerzines? Already buzzing by day, Liverpool comes alive at night and there are tonnes of brilliant nightclubs to choose from. If you’re ready to party long past bed-time, Liverpool will welcome you with open arms. The pubs and clubs around Concert Square are a good pick if you’re only in town for the night – from Envi, which regularly hosts celeb guest DJs to Modo, which is known for its gorgeous cocktails – there’s a great atmosphere wherever you turn. Just a few streets away, you’ve got a number of exclusive VIP clubs, including Penthouse, Mansion and Kingdom. Whether you want to feel like a million dollars, or you just want to get stuck in and party, Liverpool has got you covered. And with Limo-Scene’s limo hire, Liverpool is within easy reach of anywhere in the North West – so get your dancing shoes on! Got a special occasion coming up? Head to Liverpool! If you’ve got a big day coming up and you’re wondering where to go, Liverpool is full of options. 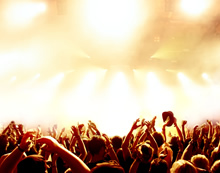 Liverpool’s music venues have something for everyone, and you can turn up in true celeb style in one of our limos! There are plenty of gigs to choose from whether you’re into classical or the classics: Liverpool’s Echo Arena plays host to A-list stars several nights a week, while the Royal Liverpool Philharmonic will delight fans of folk, world and classical music with its broad range of events. If you’re more of a theatre buff than a music lover, fear not: Liverpool’s got plenty to tickle your fancy. Take our luxury limo hire, Liverpool’s Empire Theatre and some of the city centre’s acclaimed restaurants, and you’ve got yourself all the ingredients for an unforgettable evening. If you’re planning a trip out to Liverpool or its nearby attractions, you might think that hiring a luxury limo or hummerzine would be one expense too far. But with Limo-Scene limo hire, Liverpool is much easier – and cheaper – to reach than you think. Our stunning limos and hummerzines can seat up to 18 people, so you can treat yourself to a little luxury while splitting the cost with family and friends. All of our limos come complete with a mini bar, disco lights and sound system – which is more than you can say for the train! – and with 18 of your nearest and dearest on board, it’ll probably work out cheaper as well! Getting hitched is rarely a stress-free business. Once you start planning a wedding, you realise just how many things there are to think about. And while Limo-Scene can’t help with your wedding cake woes or your flower girl’s tantrums, we can take the headache out of your wedding car hire. Liverpool is one of our busiest areas for weddings, so wherever you want to tie the knot, we’ll make the journey stress-free. You choose the venue; we’ll get you there! If you’re looking for the perfect wedding venue, Liverpool and the North West have an amazing range to choose from. Fans of traditional weddings are spoilt for choice by the beautiful local country houses, like Knowsley Hall and the gorgeous Thornton Hall. Meanwhile, those looking for something a bit different have plenty of unique wedding venues to pick from: The Athenaeum in Liverpool city centre and Sefton Park Palm House would both make for an unforgettable day. 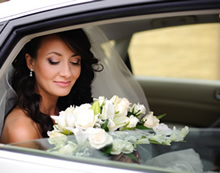 Here at Limo-Scene, we specialise in wedding car hire in Liverpool and the surrounding areas. So whichever venue you choose, you can be sure our drivers know the best routes to get you there in plenty of time. Once you’ve decided on the perfect wedding venue (not to mention the perfect dress!) it’s time to decide what kind of wedding car you want. At Limo-Scene, we have a wide array of stunning, chauffeur-driven wedding cars for hire so there’s bound to be one that takes your fancy. If you’d love to arrive at your wedding in true Hollywood style, our elegant silver Mercedes S500 with its plush leather seats and tinted windows could be just the car for you. Or, for fans of fairy-tale weddings, our adorable Beauford wedding cars and our lovely Landaulette Regal wedding cars could be just the ticket. And if you’re a bride who loves being a pink princess, we’ve got the only sugar pink Landaulette Regal wedding car in the whole of the North West, so don’t miss out! We’ve got wedding cars for hire to suit every taste and requirement – and don’t forget: all of our celebrity-style limos and hummerzines are available for weddings too! No matter where you’re located in Liverpool or the North West, Limo-Scene has got you covered. We believe in first-class service every time: all of our wedding cars are newly upholstered and regularly serviced, while our friendly, professional drivers do a trial run before each wedding to make sure there are no surprises along the way. All of our wedding cars come with champagne and ribbons matched to your colour scheme. And our experienced chauffeurs will do their best to settle your nerves, so you can sit back, relax and concentrate on getting hitched! To enquire about our wedding car hire, Liverpool brides and grooms should call FREEPHONE 0800 389 5811 between 9am and 9pm. Alternatively, there’s always our booking hotline: 07812 102 051.